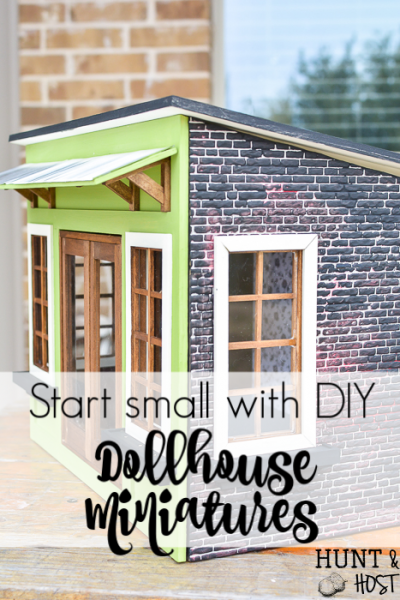 October 25, 2016 4 Comments This post may contain affiliate links. 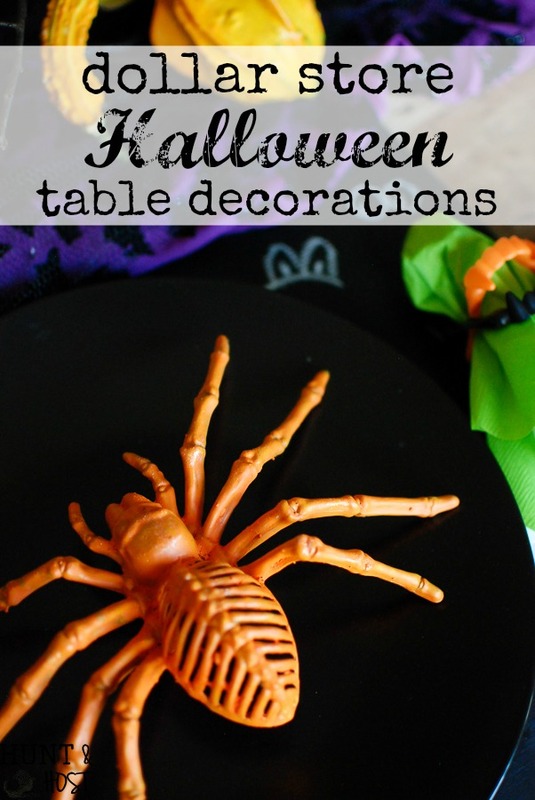 Dollar store Halloween table decorations are easy, fun and obviously great for a budget, today I am sharing a cute table for your family to enjoy! This entire month I have felt so behind! Do you ever feel that way? My to do list is longer than the hours available and those are the times that my family usually bears the brunt of my splintered time. I’m sad to say they get pushed to the back burner sometimes. As I was talking with a friend this week she renewed a spirit in me. You see, she loves to set a table. Her family eats together around the dinner table every chance they get and she makes it beautiful in her own special way. Some people may think decorating is frivolous or unnecessary and sure the world would still rotate without it, but when you are wired like she and I are it’s one of the ways we serve our family! I ENJOY doing stuff like this and my family likes it too! My daughter is just like me when it comes to holiday décor. She can’t wait to pull the next set of decorations from the attic and string nativity sets or spiders or Easter eggs from here to Timbuktu…the holiday doesn’t matter, the decorations do! My poor girl has been asking all month “when are we going to decorate for Halloween?” A full schedule of soccer and kettle corn has whittled away our weekends and I was ready to let the whole Halloween adornment go this year. 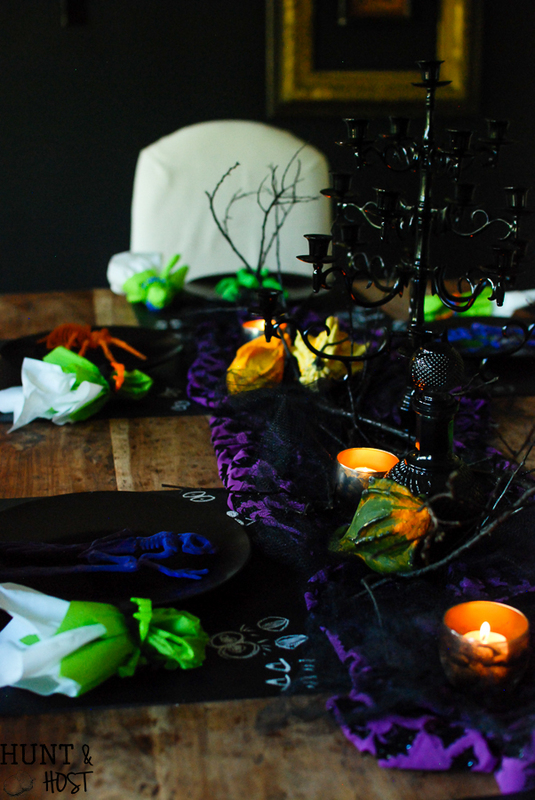 But then I chatted with my friend and I knew I could, at the very least, throw together a fun table for my people. Like her we eat together, at the table, almost every single night. This is the one spot I could deck out in Halloween garb for all of us to enjoy with only a week left until the trick or treating takes place! The dollar store did me right on this one! 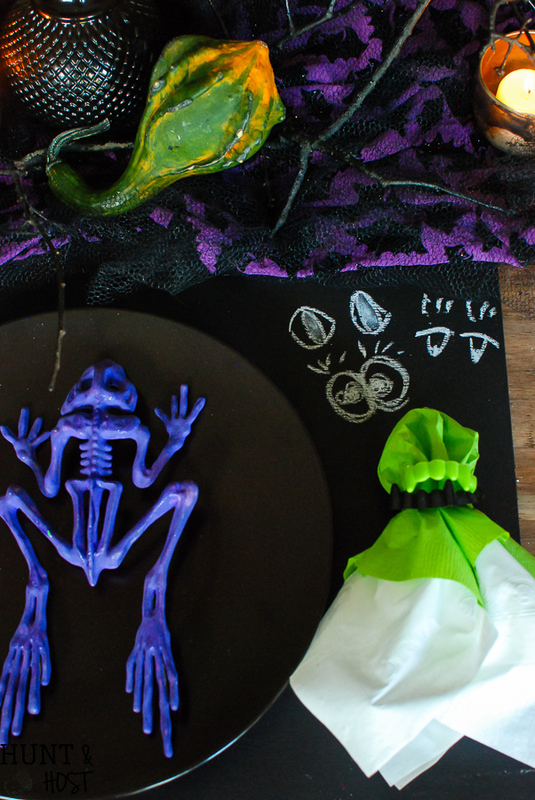 Here are my easy tips to make a no fuss, fun and easy Halloween table your whole family can enjoy. 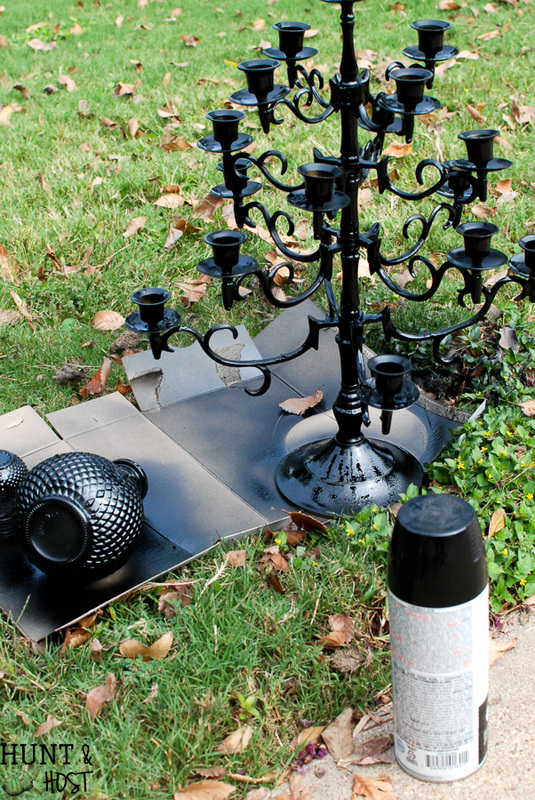 Arm yourself with a can of black spray paint and let the Halloween crafting begin! 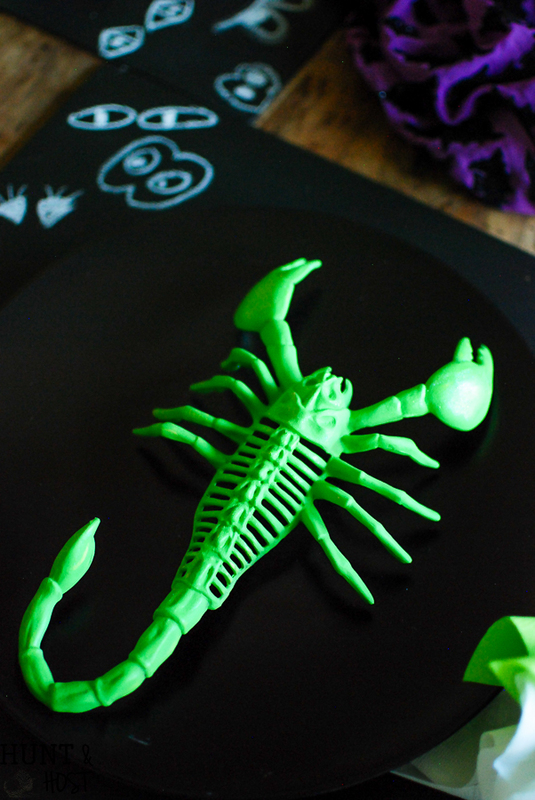 I made the rounds to a few of the dollar stores in my area and gathered some bug skeletons, vampire teeth, paper napkins and a cool glass bottle (don’t just look in the holiday section!). Fallen branches from our yard also helped make this spooky scene a success, so scoop some of those up too (look: you’re doing yard work at the same time!). 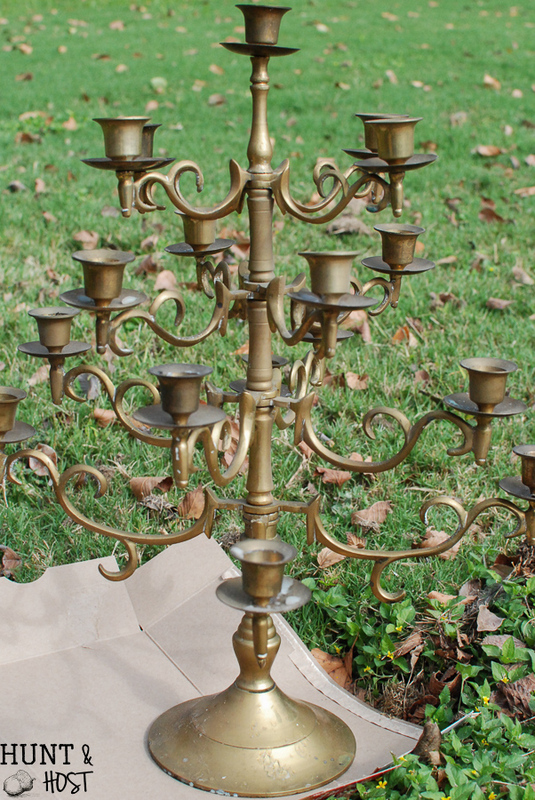 With black spray paint I transformed the branches, glass bottle and awesome brass candelabra I scored at a garage sale. 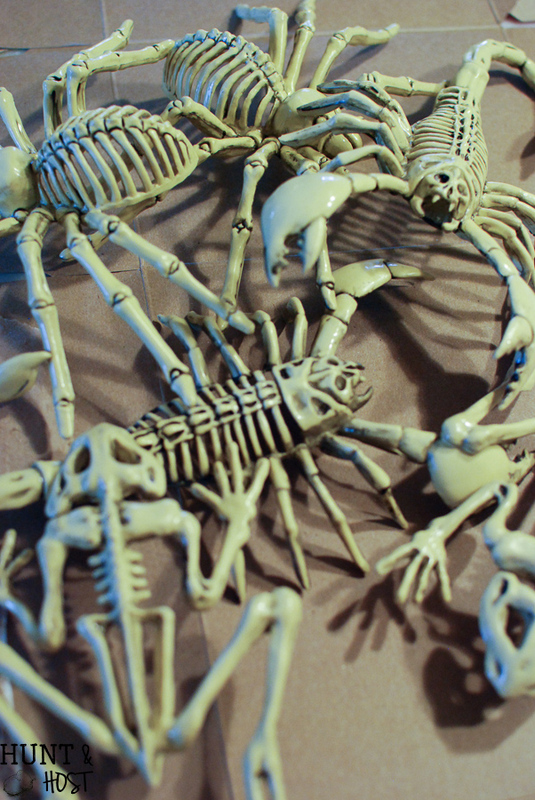 For the bug skeletons I painted them with homemade chalky paint made with acrylic craft paint. Let the kids help with this part. For an added touch I used a little Glamour Dust (glittery paint), because glitter makes everything better. 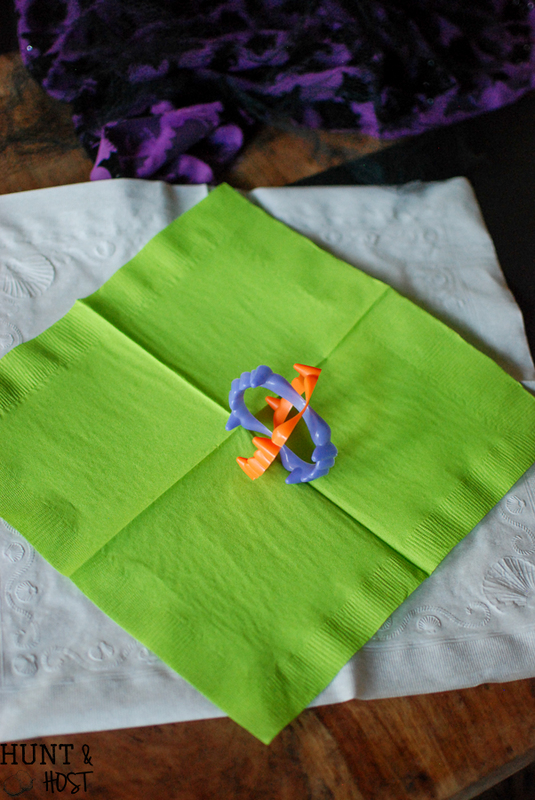 Fabric napkins are great, but let’s be real…paper is the best AND easiest. 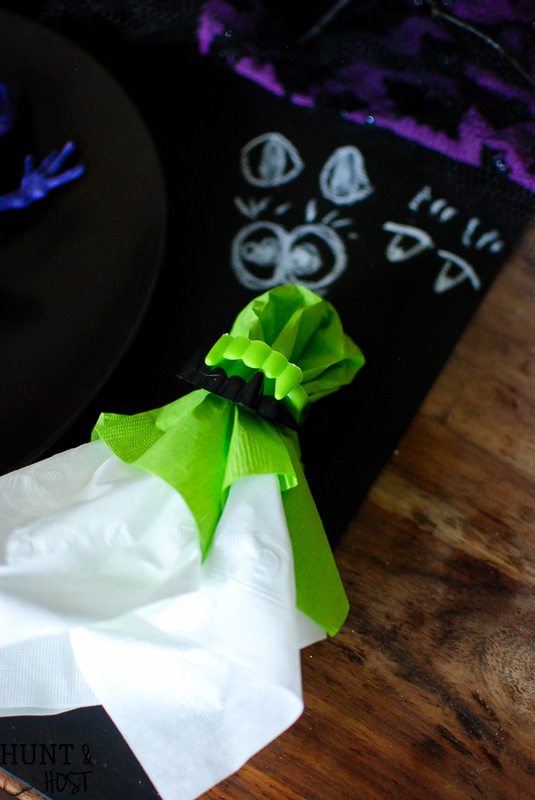 For this Halloween tablescape, I just gave paper napkins the cloth treatment by wrapping them with vampire teeth napkin rings for a fancy shmancy look. 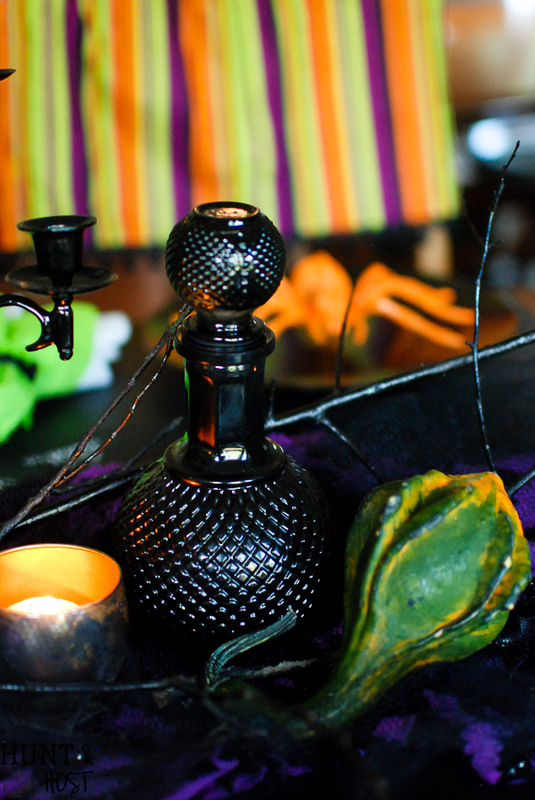 The table came together with some Halloween fabric, black tulle netting, gourds and candles I already hand on hand. 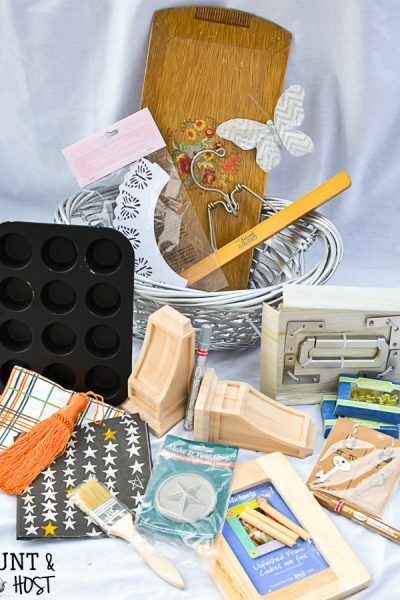 Rummage through your cabinets, you probably have tons of cool stuff you can throw in the mix! 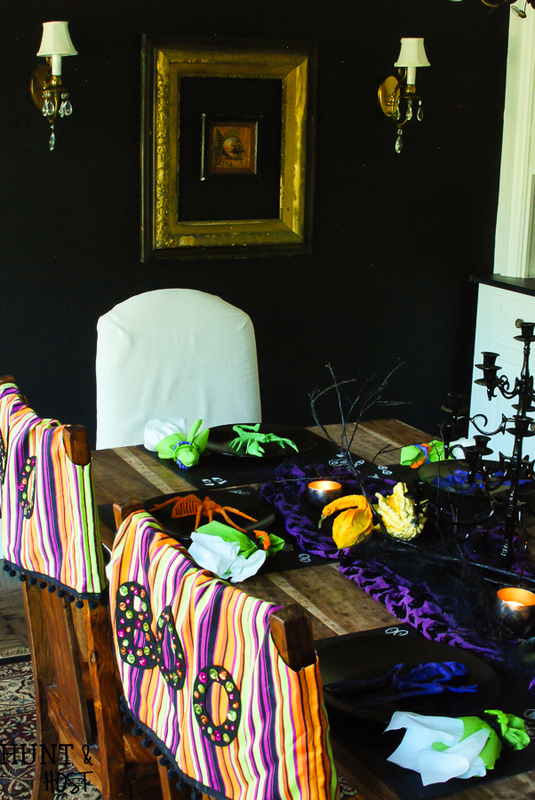 Our Halloween chair covers set the color scheme and we are still using the chalkboard placemats I made recently. 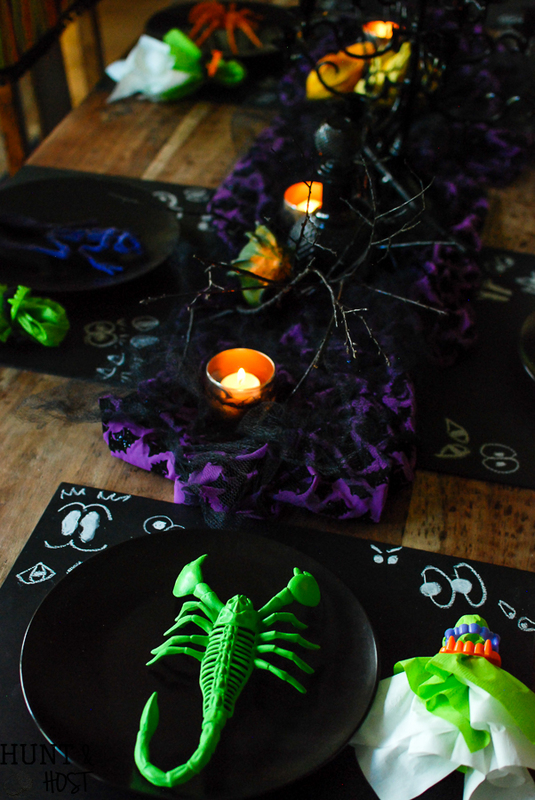 I think this dollar store Halloween table turned out slightly spooky and super fun. When we sat down for dinner last night my daughter said, ” We love the table!! 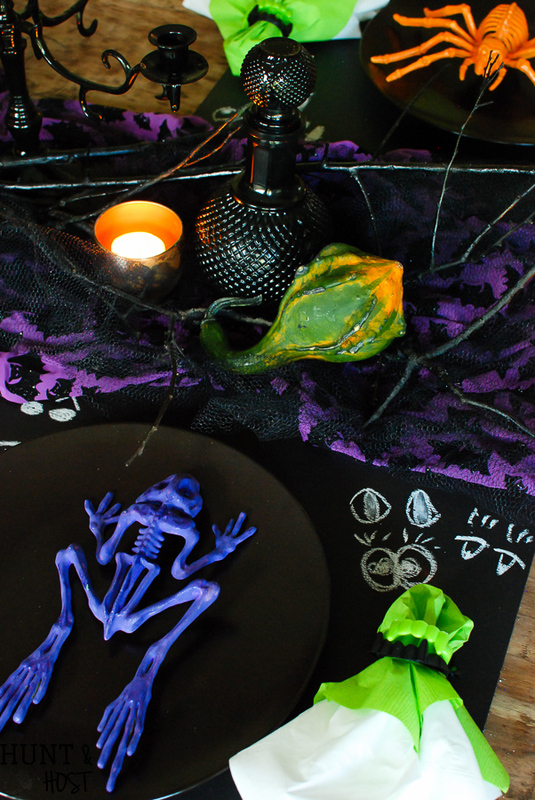 !” My mama heart smiled as they made purple frogs dance across their plates. 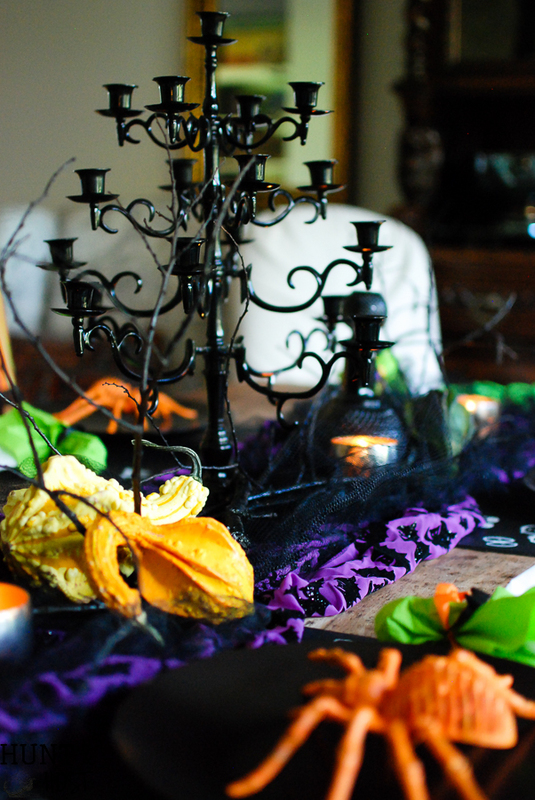 Don’t forget to pin this tablescape for later! I’d sure love it if you shared it! Happy dinner time fun friends! 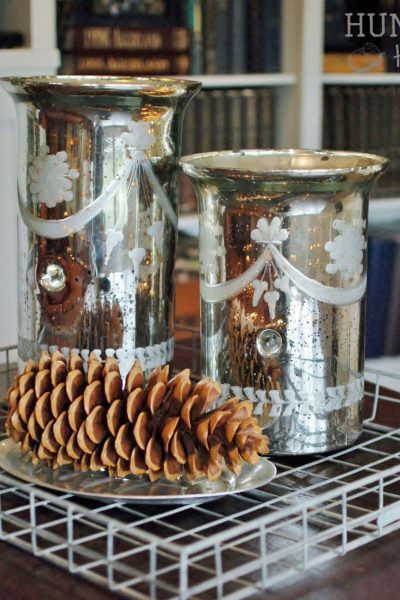 Garage Sale finds – candle sticks, etc. Love, love, love this and how you love your people! Thanks for always encouraging me to see things beyond surface value! 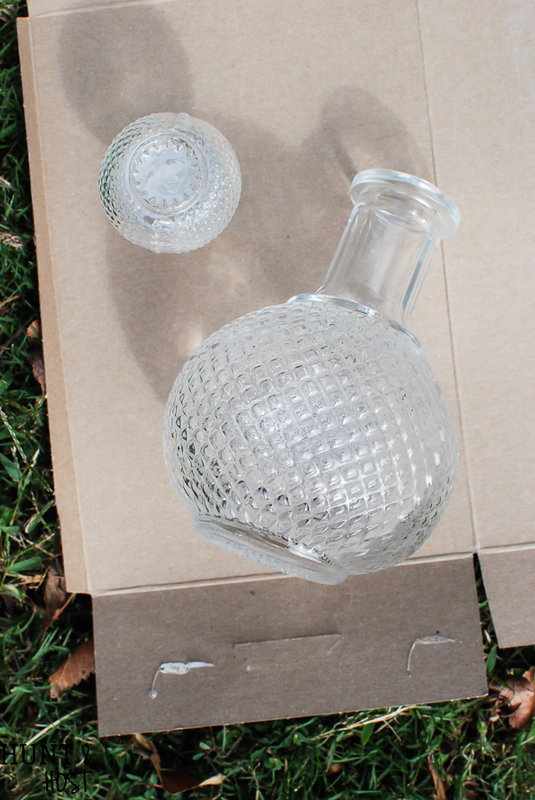 Let’s craft sometime soon!!! that would be the best!!! let’s do it! What a gorgeous and fun table! You did a tremendous job I wanna play froggie cross the table too. 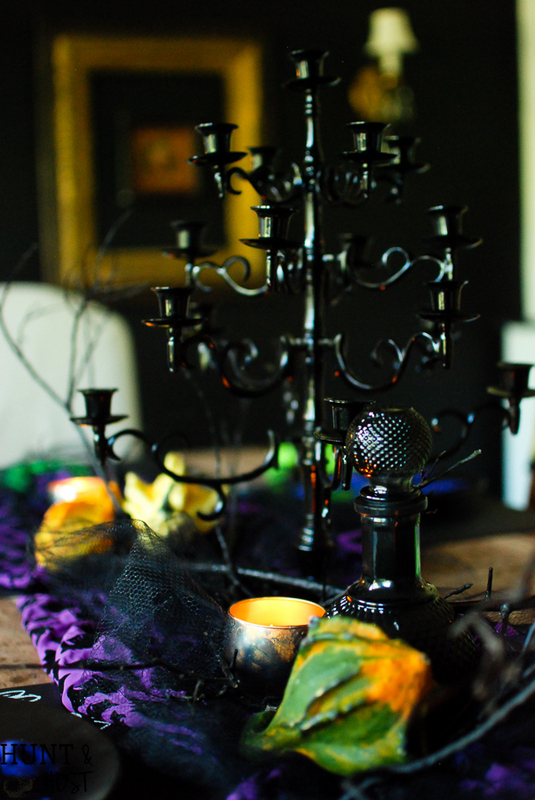 😉 Next time I see a dated weird looking candelabra I am going to buy it and paint it black….yours looks wonderful. 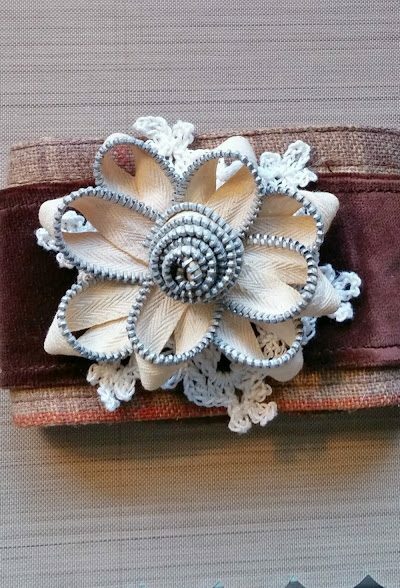 Thanks Christine, happy hunting I k=hope you find a goody!